Today I have a simple mani I created using Shimmer Polish - Lianna. I do like how all the Shimmer Polishes have girls names, although she doesn't have one that match my name exactly. I actually don't know any Lianna's in real life, the only Lianna that I'm familiar with is the one that is talked about in Game of Thrones (A Song of Fire and Ice) - ie Lyanna Stark, Eddards sister, fiance to Robert Baratheon, probable lover of Rhaegar Targaryen. Hmmm why did she die in the Tower of Joy and what was it that she made Eddard promise? I can't wait for season three to start at the end of this month - Torrent here we come! Anywho - back to Lianna the polish. 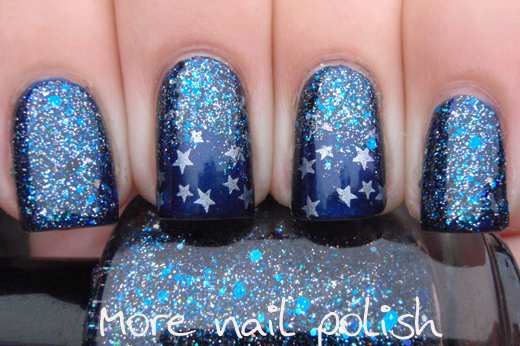 As you can see it's a mix of different blues and silver to create a navy blue glitter polish. I've layered Lianna over one of my very oldest nail polishes Loreal Jet. I've had that polish for about 20 years and its still flawless! 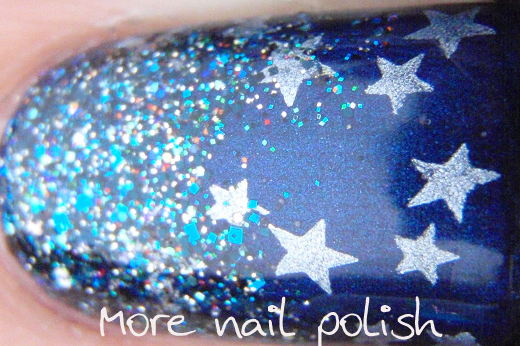 For my gradient fngers, I decided to stamp some small stars from BM012 using Essie Blue Rhapsody from their mirror metallic collection. Then I applied the gradient to the top part of my nail. 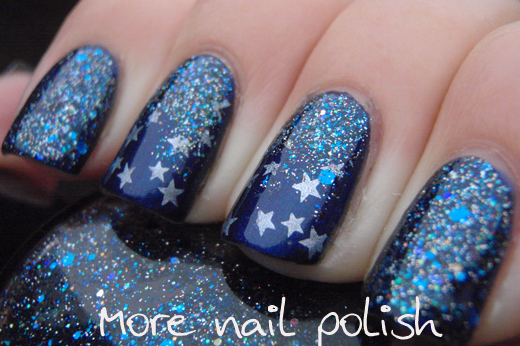 The starts make the manicure look really great! What a beautiful mani!!! Love the stars! OMG! Love it! 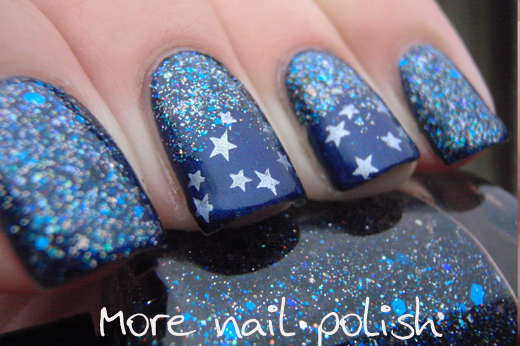 Blue and stars! super pretty with the stars! Wow pretty! I love the stars! Amazing, those stars look great! GRACIAS COMPARTO TU PAGINA EN facebook.com/pages/Recorrido-De-Maquillajes/273497772784909 !! GoT - read the books three times now and like you can't wait for season 3!!! As for your mani - perfection. Starry, starry night here I come.